Research adds clues to how old stars supply the building blocks for new planets. Richard A Lovett reports. 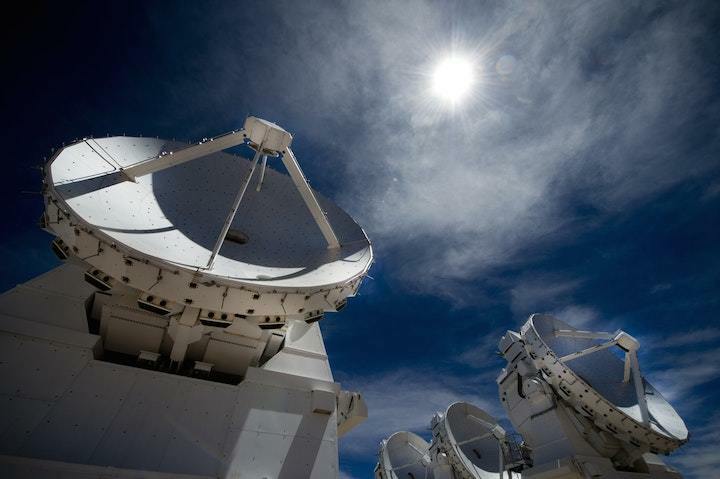 ALMA's telescopes are watching as a dying star flings aluminium into space. Astronomers using a giant telescope array on high in the Chilean desert are mapping how solar winds blowing off a dying star distribute important planet-forming materials into space, adding a new layer to our understanding of how the death of old stars helps fuel the birth of planets such as ours. The star in question, called W-Hydrae, is a large red one 254 light years away in the constellation Hydrae. It is slightly too dim to be seen with the naked eye. Nearing the end of its life, W-Hydrae is in a phase of stellar evolution during which stars are known to eject significant quantities of elements heavier than hydrogen and helium into space. This process enriches the gas and dust clouds from which new stars and planetary systems will later form. “Some of the ejected materials form the next generation of stars and planets,” says Aki Takigawa, an astromineralogist at Kyoto University, Japan. Using a collection of 66 radio telescopes known as the Atacama Large Millimetre/submillimetre Array (ALMA), Takigawa’s team was able to zoom in on this star so closely that they could see features as small as 0.035 arc-seconds, or one-one-thousandth of a degree. At that distance, Takigawa says, it is possible to see features smaller than the star itself, although the star is so huge that it would fill our entire solar system well out into the Asteroid Belt. These molecules included aluminium monoxide (AlO), which condenses into aluminium-containing grains as it cools, and silicon oxide (SiO), which condenses into rock-like silicate dust. They escape the star not just because they are blasted off its surface at high speeds, but because radiation pressure from the star’s light creates a stellar wind that steadily accelerates them and sweeps them off toward interstellar space. One of the mysteries of this process, however, has been that while silicon is much more common in the galaxy as a whole than aluminium, the regions around stars such as W-Hydrae appear to be unexpectedly rich in aluminium oxide particles. The new research, published earlier this month in Science Advances, found that this might be due to a combination of factors. One is that aluminium oxide particles condense from vapour at a higher temperature than silicate particles. That means that they form closer to the star than the silicates. Once formed and accumulated to sufficient quantities, the particles are subject to radiation pressure, which accelerates them outward, carrying other gases with them. The result is that the later-to-condense silicon oxide molecules are picked up in the maelstrom and blown away from the star so fast that by the time they have cooled enough to condense they are too dispersed to do so. In other words, the silicon is there, but remains as silicon oxide gas, rather than condensing into dust particles. “Our estimation showed that more than 70% of SiO molecules remain in the gas phase,” Takigawa says. All of this is important, she adds, because planetary scientists studying our own solar system have found “pre-solar” aluminium oxide and silicate grains in primitive meteorites — grains that were formed before the solar system and have remained unaltered over the ensuing billions of years. The stars that formed these grains died more than 4.6 billion years ago, she says, “but we can now study similar stars with telescopes”. Brad Tucker, an astrophysicist and cosmologist at Australian National University, agrees. Finding large amounts of aluminum oxide dust, he adds, is quite interesting because some of the first exoplanet atmospheres that have been measured contain another metal oxide, titanium oxide. “I bring this up because the dust and gas that leaves [stars like W-Hydrae] will eventually form new star systems and planets,” he says, “and some of the new planets we are finding are weird. An important next step, he notes, will be to use ALMA to take images of exploding stars. “The dust involved in supernova explosions has lots of questions that need to be solved,” he says.